"If you don't believe in resurrection, if you don't believe in the empty tomb, come to New Orleans because it is proof of resurrection. It is a new New Orleans." — The Rev. Carol "Callie" Winn Crawford, pastor of Rayne United Methodist Church on the 10th anniversary of Katrina. 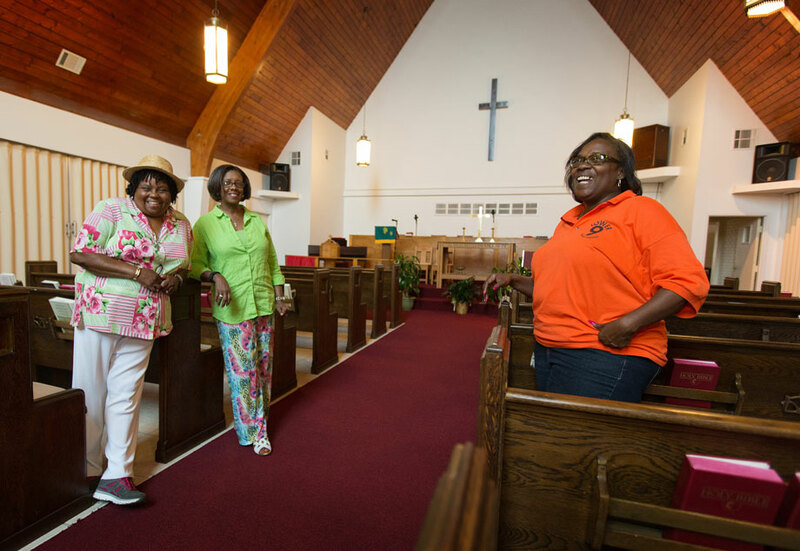 Church members show the restored sanctuary at Hartzell United Methodist Church in New Orleans' Lower 9th Ward. The sanctuary was flooded by Hurricane Katrina in 2005. From left are: Burnetta D. Fauria, Angelique White Williams and Andrea Sanchez-Reese. Photo by Mike DuBose, UMNS. One decade later, people in Louisiana and Mississippi are looking at Hurricane Katrina in their rear-view mirrors and giving thanks to hundreds of thousands of United Methodists who put their money, hearts and hands into healing the Gulf Coast region. Long-term recovery is an accurate description when it comes to Katrina. The United Methodist Committee on Relief closed out its last grant to the Mississippi Conference in December 2013. Even now, training must continue and equipment and facilities maintained in preparation for the next major disaster. The same is true for Louisiana. “From 2005, until we closed shop in 2012, we helped over 125,000 households in the state of Louisiana,” said the Rev. Darryl Tate, director of disaster response for the Louisiana Conference. United Methodists in that state multiplied about $35 million allocated by UMCOR with volunteer labor and other gifts, bringing the total to an estimated $139 million worth of in-kind donations, he added. Ten years after Hurricane Katrina devastated New Orleans and the Gulf Coast, hundreds of thousands of United Methodists have volunteered or donated money for the cleanup. In this slideshow, photographer Mike DuBose pairs photos from immediately after the storm with images that show how far the recovery has come a decade later. *Click on the i in the upper left-hand corner above the slideshow to display caption information. To turn captions off, simply click on the caption. 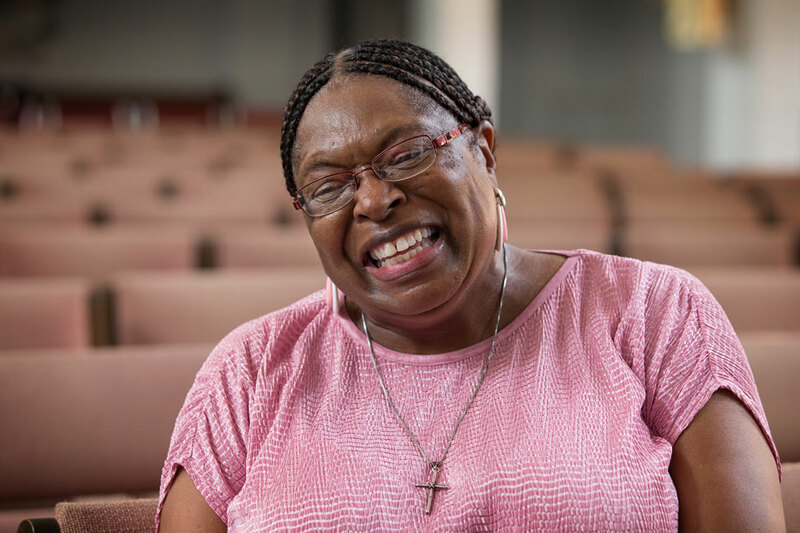 Epworth Project in Slidell, Louisiana, still sends more than 1,400 volunteers a year to help homeowners like Betty Johnson in East New Orleans. This summer, she sat on her back porch watching teams of young people do in a few months the repairs she tried for 10 years to finish. Her house is not the only one on the street that still needs major repairs. Many congregations make Louisiana or Mississippi the destination for annual youth mission trips. Ginghamsburg Church in Tipp City, Ohio, has sent 85 teams, including one earlier this summer. Hundreds of volunteers and homeowners have formed life-long relationships. When the Rev. Marilyn von Roeder-Kunkel was ordained, her “family” from New Orleans traveled to Corpus Christi to witness that milestone.Roeder-Kunkel met Elvina and Vince DiBartolo and their granddaughter, Gabby, when they were evacuated from New Orleans to Victoria, Texas, in 2005. From that point on, Roeder-Kunkel started gathering mission teams to go to New Orleans. “We’ve become a real family,” she said. The Rev. 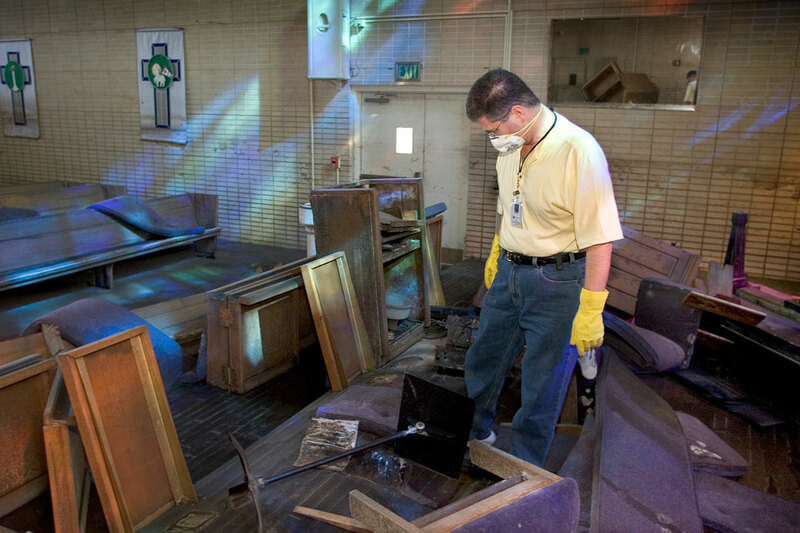 Darryl Tate views the ruined sanctuary of St. Luke’s United Methodist Church in New Orleans for the first time since he fled Hurricane Katrina in this 2005 file photo. File photo by Mike DuBose, UMNS. A decade later, Hazelwood is still amazed that within the first year following Katrina, every U.S. congregation seemed to have “a laser focus” on responding. Those efforts meant everything to many people. Tom Bocek and his family lost not just one but two homes after Katrina. Their second home was destroyed by fire the day they moved in new furniture. Bocek, a retired military man, was working to rebuild his second home when he just lost hope. That’s when an UMCOR van drove up with 11 volunteers. They came in smiling, they prayed, they helped hang sheetrock. Sue Bymul (front) works with other members of her team from Christ Church United Methodist in New York at the home of Alberta Paige in Biloxi, Miss., after Hurricane Katrina in this 2006 file photo. File photo by Mike DuBose, UMNS. For two and a half years after the hurricane, UMCOR oversaw Katrina Aid Today, a national case management consortium funded through a $66 million grant from the Department of Homeland Security and Federal Emergency Management Agency. That grant, funded by donations from foreign governments for post-Katrina rehabilitation, was the largest single government-managed grant ever given to the private sector for disaster response. At its peak, Katrina Aid Today had 138 offices in 34 states. Each of the nine faith-based and voluntary organizations in the consortium, including UMCOR, provided in-kind services and their own aid for Katrina recovery. 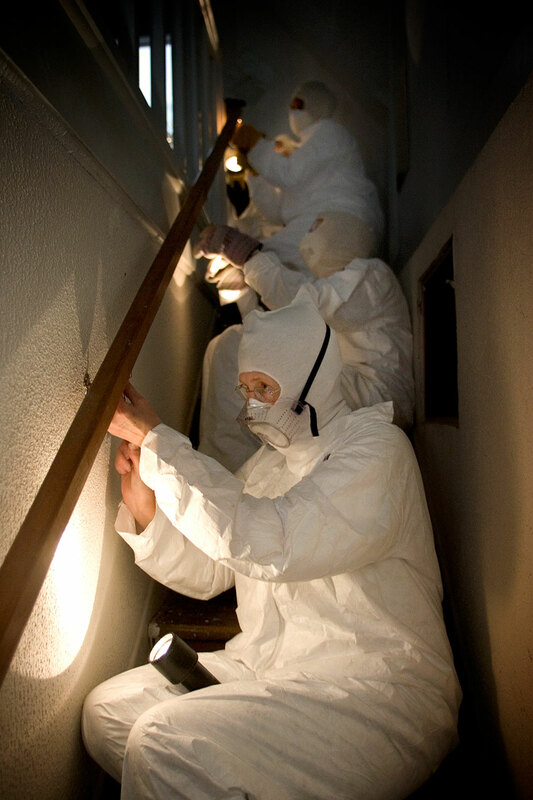 Before closing on March 31, 2008, the program assisted more than 73,000 households with long-term recovery. It was the first such cooperative venture and Hazelwood attributes its creation to the Rev. Paul Dirdak, who was UMCOR’s top executive at the time. “He was the catalyst who saw what we could do and was smart enough to figure out how we could put together a proposal that would work,” Hazelwood said. The team that made it work included Hazelwood, the Rev. Kristen Sachen, Jim Cox and Warren Harrity, who wrote the proposal for Katrina Aid Today. Harrity and Cox both later served terms as the organization’s executive director. Catherine Earl — currently UMCOR executive secretary for disaster response in the U.S, Caribbean, Central America — made it all happen by developing the training methods used for case management, Hazelwood said. What was needed, Earl said, were skilled and capable people with just “the right mix of empathy and common sense” to offer individual assistance and help Katrina survivors plot their next steps and navigate complicated disaster recovery systems. The United Methodist Council of Bishops also established the Katrina Church Recovery Appeal and distributed $2 million in February 2007 to help restore damaged church facilities, pay salaries for clergy while their congregations could not, establish new congregations or consolidate existing ones, renew church-based community ministries and provide churches in need with worship resources. Margaret Ferguson Washington relays some of the history of First Grace United Methodist Church in New Orleans. Photo by Mike DuBose, UMNS. UMCOR’s own disaster response for Katrina was a three-stage process: an emergency stage of up to 10 days; the relief stage, to help homeowners who needed to muck out, assess damage and receive emotional and spiritual care, and the long-term recovery stage. By the third anniversary of Katrina, UMCOR had committed a total of $66.8 million for recovery from Katrina and other 2005 hurricanes, including about $23.8 million to the Louisiana Conference, $14.2 million to the Mississippi Conference, $5.5 million to the Texas Conference, $2.1 million to the Florida Conference and $2 million to the Alabama-West Florida Conference. Other major funding included $4.9 million to grassroots partners of Katrina Aid Today and $4 million to G.R.A.C.E Community services (a local Texas organization helping Katrina evacuees). “If you don’t believe in resurrection, if you don’t believe in the empty tomb, come to New Orleans because it is proof of resurrection. It is a new New Orleans,” said the Rev. Carol “Callie” Winn Crawford, pastor of Rayne United Methodist church. “We were deader than dead after Katrina,” Crawford said. The Rev. Don Cottrell, provost of the United Methodist Louisiana Conference, said the city has probably shrunk by 100,000. “New Orleans is not the place it was but it is still a great place,” Cottrell said. Central New Orleans and the French Quarter are back to normal, he said, and people have learned a lot over the past 10 years about starting over. Sometimes starting over meant making something new. Once there was First United Methodist, a historically white church, and Grace United Methodist, a historically African-American church. They were just a mile apart geographically but worlds apart culturally. Now they are one: First Grace. Right after the storm, the combined congregation averaged around 60. Now, with 285 members, the church has added a Spanish language service on Sundays. The church’s doors are open most days and nights with ministries ranging from a homeless shelter for women and children to a legal clinic for immigrants. “When we first started there was a great deal of anxiety with African-Americans and white members saying, ‘Oh, we are going to lose our identity.’ During that five-month courtship that’s when we looked at what will we retain and what will we give up. What is it that makes us the body of Christ?” said Margaret Ferguson Washington, one of the first members of First Grace. That question moves First Grace forward. 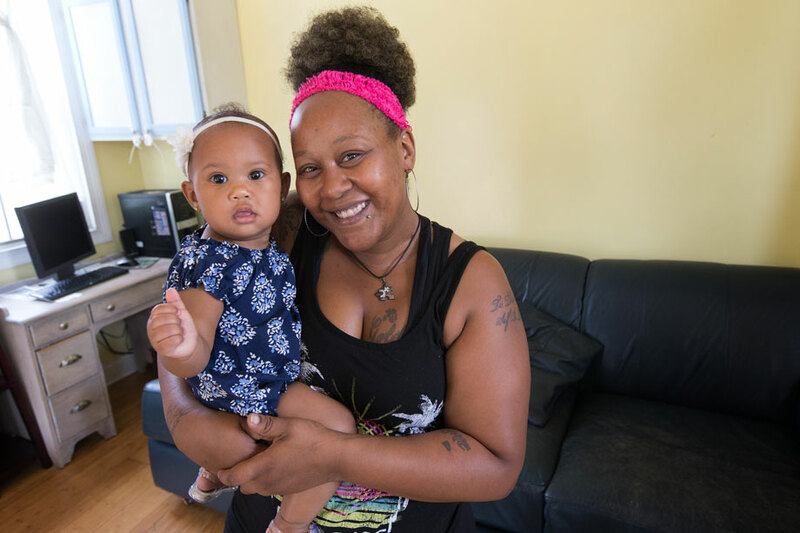 Shante and her 10-month-old daughter Ja'Lyn are residents of Hagar's House, a sanctuary for women and children in New Orleans. The ministry was begun by First Grace United Methodist Church following Hurricane Katrina. Photo by Mike DuBose, UMNS. Many homes, churches and businesses took a beating but Moore Community House, a United Methodist mission that has been in Biloxi for 90 years, came through the storm stronger than before. “I would never had believed, in 2007, if someone had told me in 2015 (that) I would say there were silver linings to Katrina,” said the Rev. Carol Burnett, director, laughing. It took the center until 2010 to reopen at a cost of about $3.5 million. Burnett said the silver linings are due to “support from a ton of United Methodist congregations,” the United Methodist Committee on Relief andUnited Methodist Women. Another United Methodist ministry that is going stronger than before is Seashore Mission. The day shelter for the homeless provides 200 meals, three days a week. It also provides showers, laundry facilities, free clothes, a food pantry and a rousing Sunday worship service. “We were here before Katrina and we are thriving more now,” said Judy Longo, a United Methodist local pastor and director of the mission. During the hurricane, several members of the church and the community died when Seashore’s building was destroyed, leaving just a slab. A 6,500 square-foot building that was Bankston Paint Store has been transformed into new mission space. “We are here for a reason, God placed us in this building in this location for a reason. We are in a perfect place … we feed the body and the soul,” Longo said with a big grin. In 2005, the Rev. Darryl Tate was fleeing St. Luke United Methodist Church in New Orleans as Hurricane Katrina was washing away the levee and flooding his Lakeview home and church. The only thing saved from St. Paul United Methodist Church in Pass Christian, Mississippi, after Katrina was a huge Bible that now has a place of prominence inside a glass enclosure in the entrance hall. The church is back, but for members like Janet Alexander, getting their own home put back together is still a dream. Alexander said she survived Hurricane Camille in 1969 but Katrina was worst. “We lost a lot of people after, people we didn’t think would ever be sick, they just died. We lived in a FEMA trailer for about a year – myself, my husband, my daughter and her two kids and one son. All of us in that little tiny trailer. Seemed like you had to go outside for everything, too many people inside,” she said, smiling and shaking her head. Read full UMNS coverage of Katrina.